What if I only want a simple life? What if I only want a mediocre life, full of small moments that make your soul happy. We live in such a busy world full of technology, screens, and less connection while we are more connected than ever. I am like many, I have a horrible confession. I tried to "keep up with the Jones" and that only ended in a heap of debt and myself wondering who in the world the Jones were? I was suffering from depression, lacking true joy and connection all because I was trying to live above our means because it was what was expected in our overly "pinned" world. I have been overall depleted from the things I needed trying to chase the things I wanted. It left me not ever thinking that I was enough or that I was doing enough. God has opened my eyes to so much the past few years but more so the past few months. The world is such a noisy place, what do you do if you crave simple and quite. What happens if you don't want to have a Pinterest house (nothing wrong if you do) or keep up with the Jones any more (sorry if your the last name is Jones, I am referring to the saying. What happens if you no longer want to accumulate the debt to keep everyone from knowing that you are facing a life-changing situation. I have learned that people will be there for you regardless, it is the devil telling you different. He has us so distracted by money, social media, and power that we lose sight of the one that matters, Jesus. When we lose sight of Jesus, we start losing our faith, our families, our marriages, and so much more. Our lives start ripping away at the seams. I use to dream of having the finer things, but my vision has been adjusted. I want my family to have more of me and fewer things. They don't remember the best day of tv nor do they remember the best gift they got at Christmas time. They simply remember what we did together instead. Today my middle daughter looked at me and said, I want to be a mom just like you when I grow up. She made my day, at that moment I wasn't doing anything fancy other than making cheese quesadillas and cutting apples. That was an eye-opening moment for me, my daughter loves me just the way I am. To her, I am doing everything right even if it's so wrong to me. Over the weekend I baked my youngest daughter a cake, I thought it was good enough not even "mediocre" but when it was time for her to see it she said in her cutest three-year-old voice "Wow, I like it". Now here is the thing about a simple life, although she gets store-bought cake a lot, her homemade rainbow cake has been her favorite so far. If we truly took a moment to see things as our children see them our lives would be forever changed. Our children look at a 4ft Christmas tree with the same wonder and excitement as a 10ft one. We all need to go back to a more simple childlike faith and i truly believe our lives would start to change. The older I get the more things get put into perspective rather than striving, wishing, hoping, wanting more things, & better-paying jobs. We should simply switch our focus to our faith, serving God more, being more like Jesus and see where our lives end up. I greatly prefer stability over more money, I prefer having my husband home more rather than working extra so he can also make memories with our daughters. The memories that we make with them are priceless, they will last a lifetime and with any luck, the same traditions will get past down to their children and so on. We have to reclaim our joys in life so we don't let happiness slip by. We need to prioritize our marriages, our families and our homes more then anything else aside from our faith in Jesus Christ. While I was far from a hoarder I kept things I really didn't need like all of my three daughters baby clothes knowing that chapter in my life had closed, I had put an emotional value on things more than I ever should have. This year I have slowly downsized tremendously, toys, clothes, and half empty bottles of shampoo I was holding on for "one day" just in case. I have found it freeing to be able to get rid of actually clutter at the same time as "decluttering" my soul. Although I have had some setbacks this year, I have inched closer to my goal of becoming more of a minimalist and I have seen a change in my depression. With less to clean and more time to read and spend time with my family. I have faced the deeper issues hidden behind the stuff and I feel so much better. I find calm in my mediocre lifestyle nestled in the Appalachian Mountains. My home is a cozy place where I can watch the season change and my children grow. 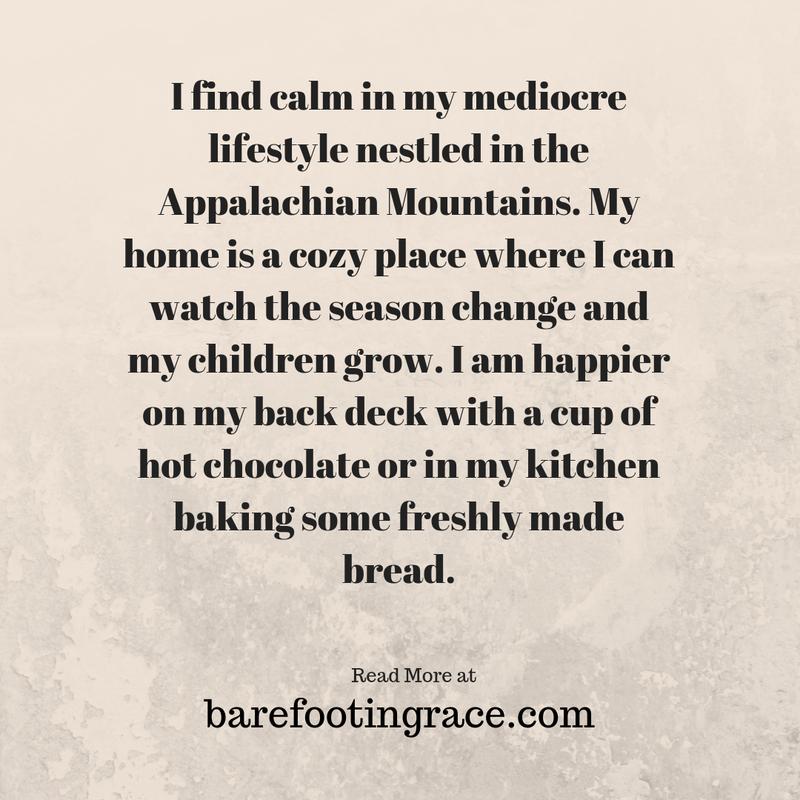 I am happier on my back deck with a cup of hot chocolate or in my kitchen baking some freshly made bread. I love to watch flowers and my garden grow. There is simplicity in a slow life that you don't see anymore because of how fast-paced the world is. We still watch TV and have to set through commercials and we are not on our electronics as much as we use to be, because I want them to know the joy of a simple life. The rest is just extras because they will know the value of small moments. If anything it's my daughters that have taught me to slow down, because they are only little once. One day my house will be spotless but it will also be silent. The definition of mediocre is of only moderate quality; not very good. I think that you can define it however you want because being mediocre isn't always a bad thing. Live life the way that you want, find joy in the simple things.